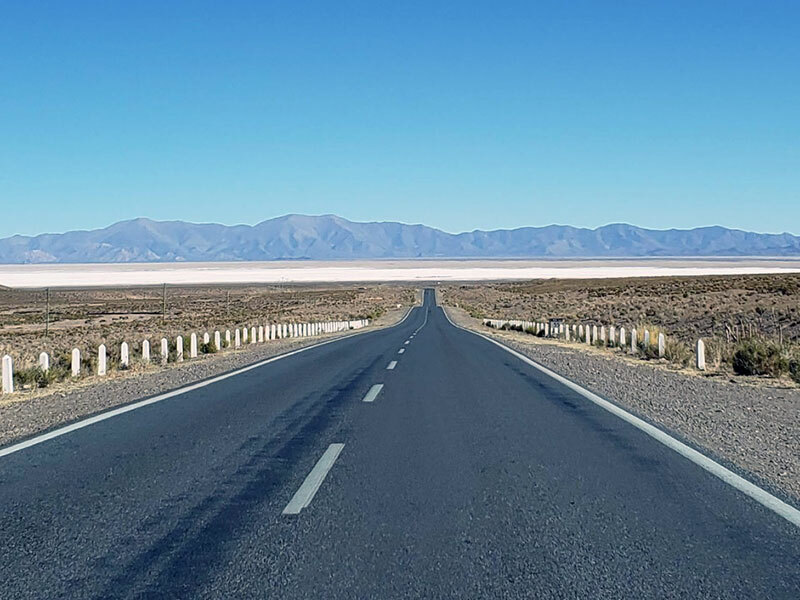 Ruta Nacional 40 is the longest route in Argentina and one of the longest in the world. 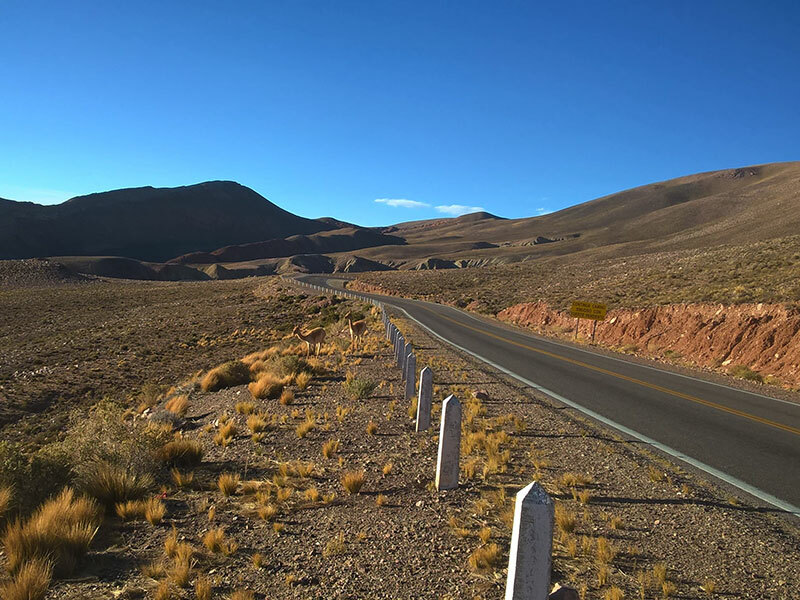 Most of the highway runs alongside and sometimes within the Andes Mountain range, passing through some of the most extraordinary landscapes on the planet and connecting several national parks. 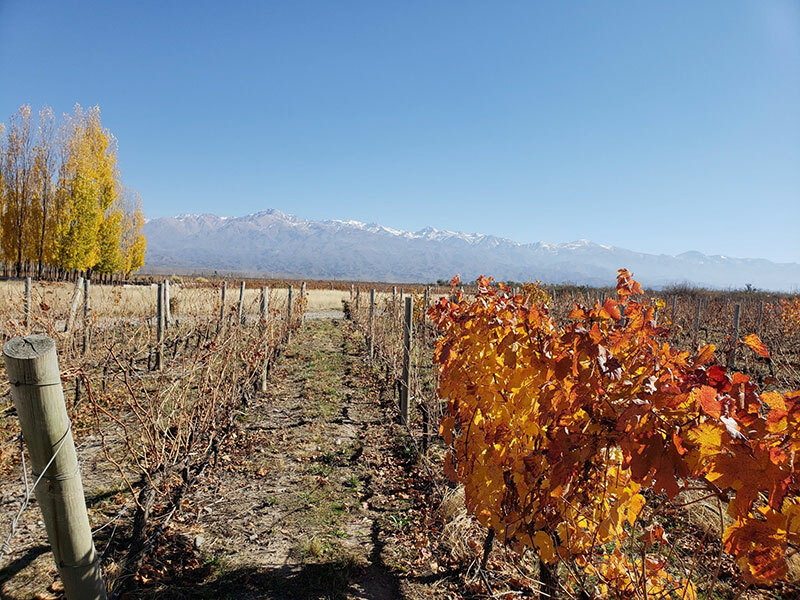 This itinerary starts with Mendoza, the heart of Argentina’s wine country, famed for Malbecs and other red wines. Its many bodegas (wineries) offer tastings and tours. 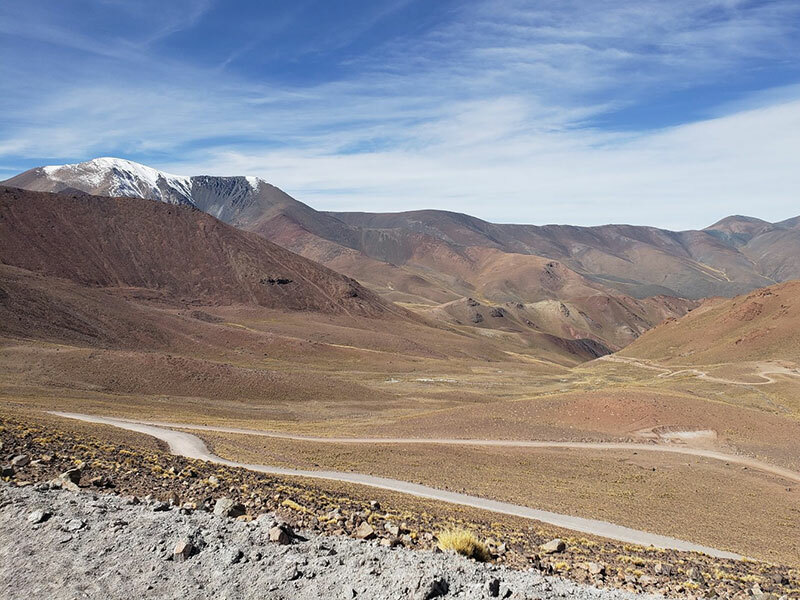 It continues along Calingasta Valley under the constant surveillance of 6,770-meter-high Mount Mercedario and Mpunt Aconcagua, which reaches 6,960 meters. 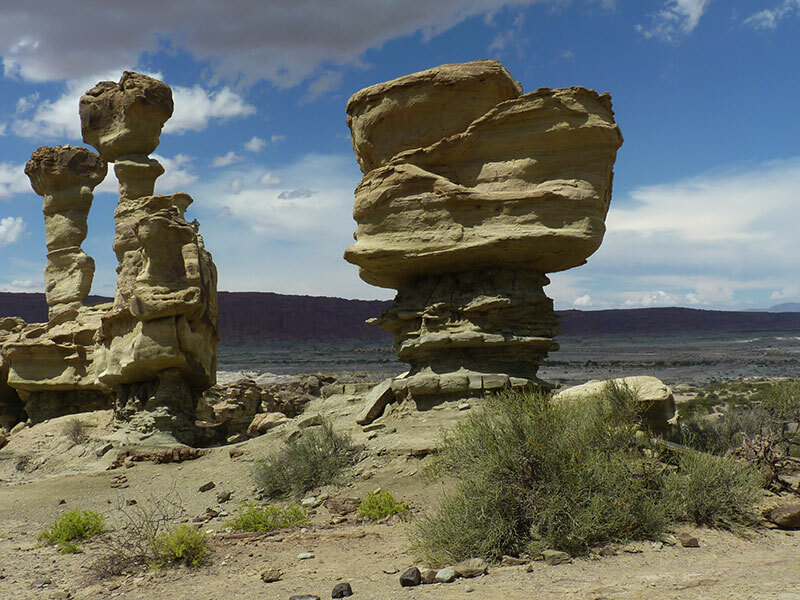 Ischigualasto and Talampaya to allow us a look into the past of our planet. 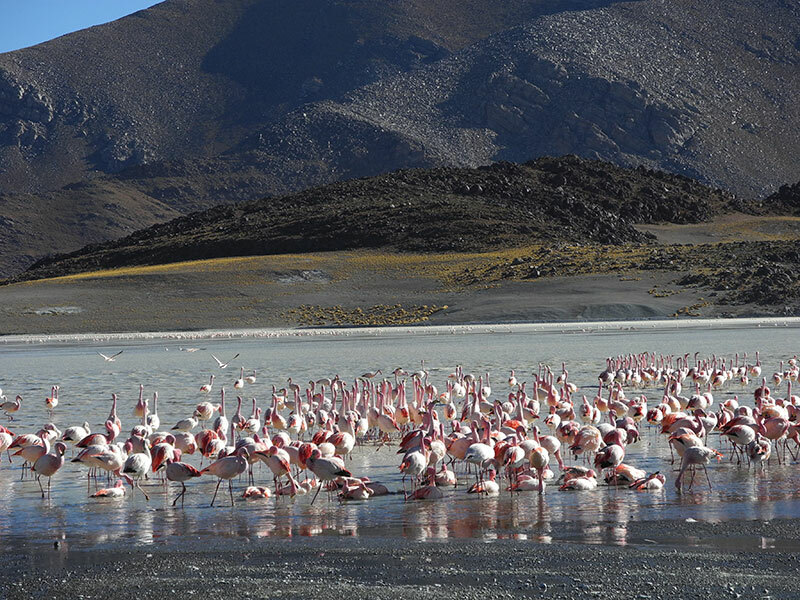 Finally reaching the Argentinean Northwest, indigenous cultural destinations are settled in rugged mountains and deep valleys, whose bizarre rock walls seeped with a rainbow of colors. Transfer from the airport to the hotel, where you enjoy 2 overnight stays at a hotel in the city center or at a wine lodge in Luján de Cuyo. In the morning car reception at the hotel. 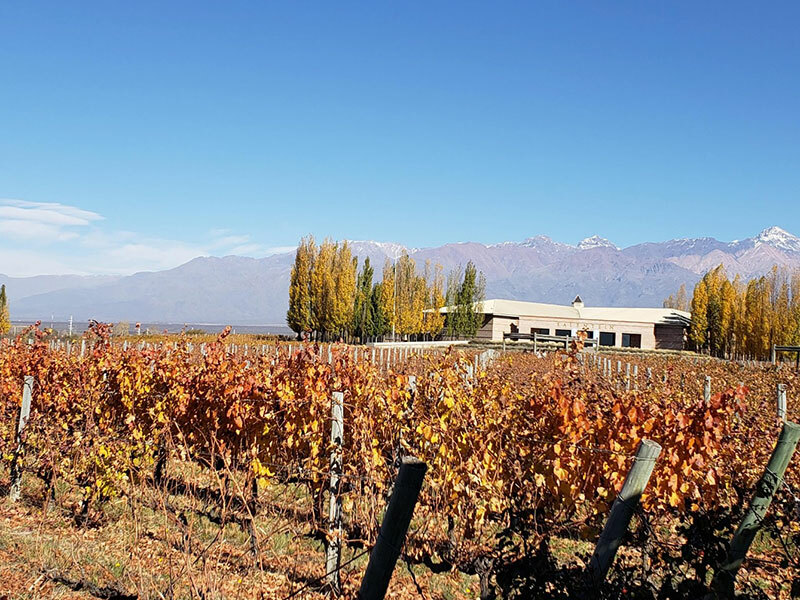 We recommend you to visit some of the Wineries located in the surroundings of the city, such as Catena Zapata, La Rural and Terrazas. 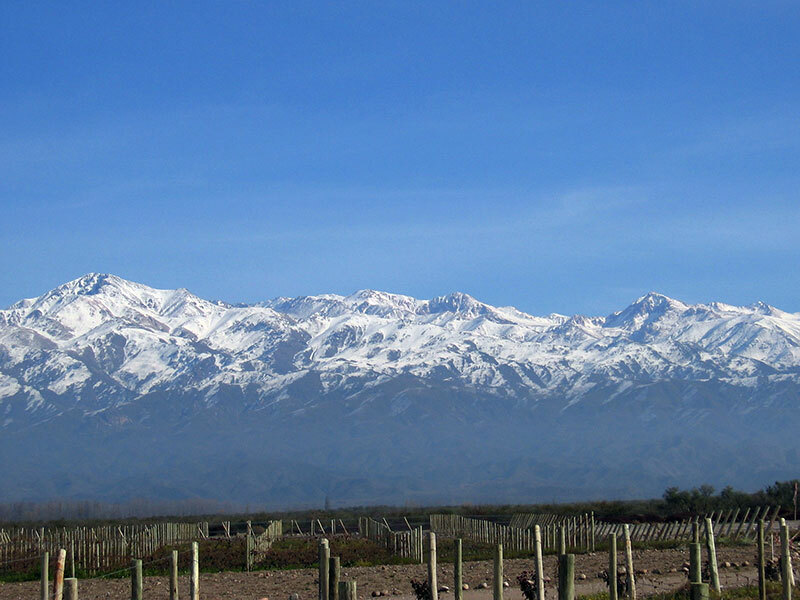 Drive along Ruta 52 towrads North up to the thermal baths of Villavicencio, here steeply up to 3000 m, where you can see the three seven-thousanders of Mercedario, Aconcagua and Tupungato from the pass. Head down to Uspallata, here the Ruta 412 of the Uspallata Valley into the province of San Juan, passing the National Park El Leoncito, known throughout the world due to its outstanding wind and sand conditions, governing the performance of the wind kartings, and the Astronomical Observatory. 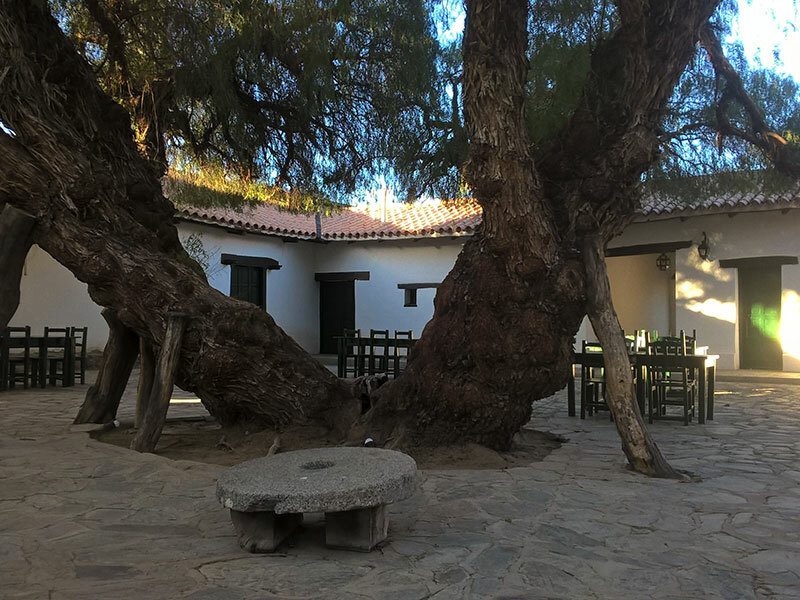 2 nights in the nearby small oases village El Barreal in the Posada Paso los Patos, with a great view to Mount Mercedario (6770 m). Driving distance: 160 km paved and 45 km gravel road. Possible excursion in the area along the magnificent Galingasta valley. Another option is to make a hike among bizarre rock formations on the eastern edge of the village, especially beautiful at sunset light. Drive north on Ruta 412 to Calingasta, there on the Ruta 12 and 414 east to Talacasto where one encounters the new Ruta 150. 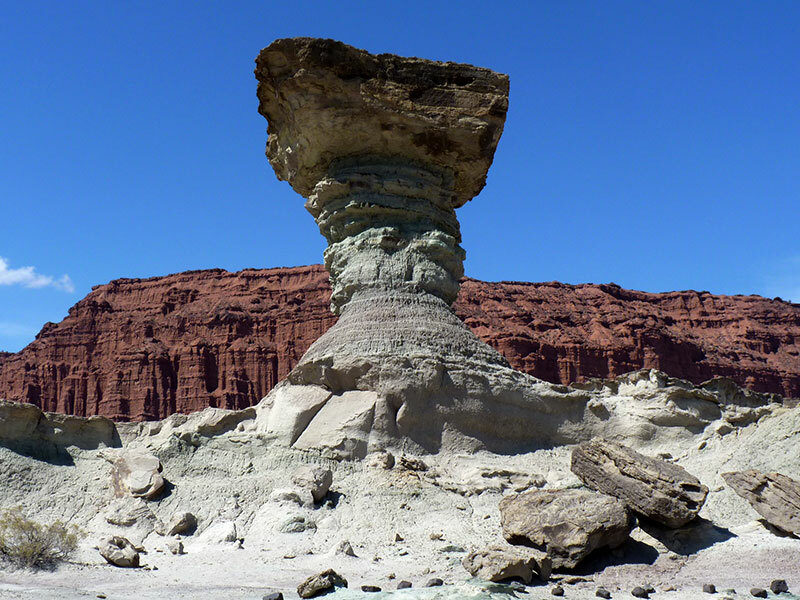 Continue on this one eastbound to the bizarre “moon valley” Ischigualasto where a guided tour with a local guide can be made. In the late afternoon arrival to Villa Union. 2 overnight stays at a hotel. Distance: 425 km paved road. Today we recommend a drive back southwards along Ruta 76 to the impressive Talampaya National Park, with its huge rock walls and natural shaped figures. There is a guided tour in the Park that takes place in a 4×4 truck. Distance: 130 km paved road. Today trip continues on Route 40 eastwards down the very curvy and steep Cuesta de Miranda to Chilecito, a green oasis with vineyards. 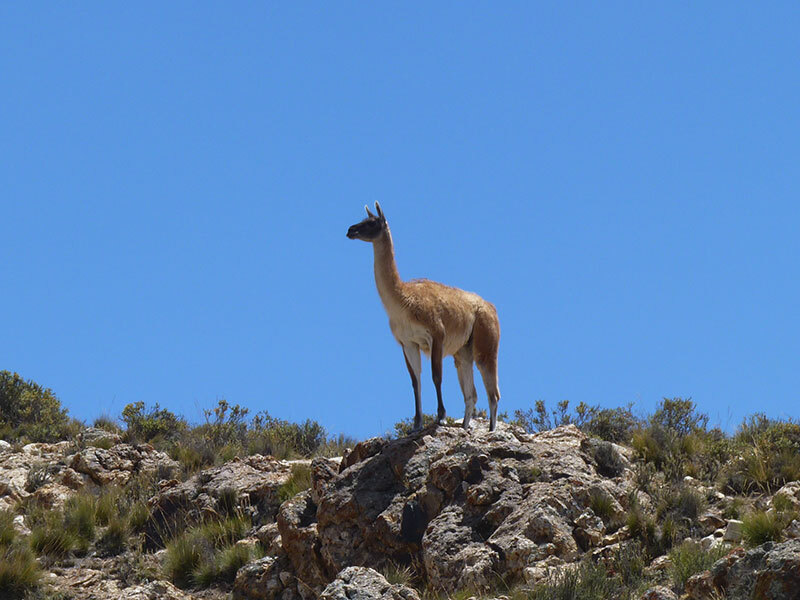 There head on North to Belén in the province of Catamarca. 1 overnight stay at a simple hotel. Continue north on Route 40 passing Hualfin (archaeological site, one of the oldest Indian cultures of the country) and the sandy steppes of Pozuelos to Santa María, there short border cross to Tucumán. 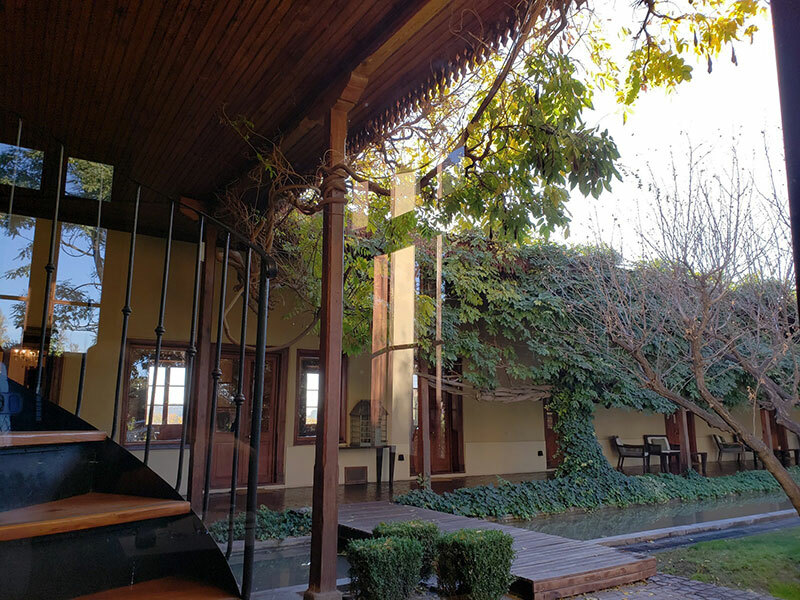 Here you can visit the ruins of Quilmes culture, then on to Salta-province to Cafayate, an excellent wine-growing region, famous for its white wines. 1 overnight stay at Cafayate Wine Resort. Distance: 260 km paved road. 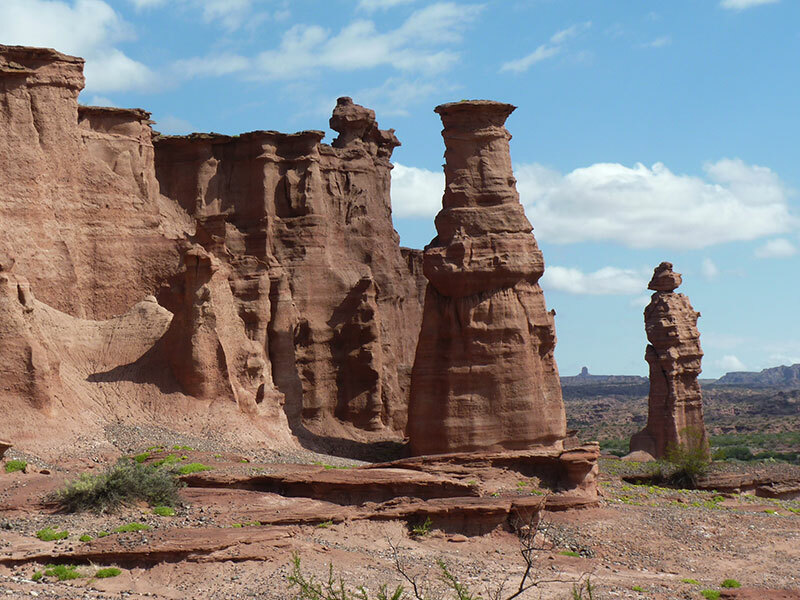 In the afternoon explore the beautiful Quebrada de las Conchas with its red shimmering rock formations, at this time the best daylight for the area. 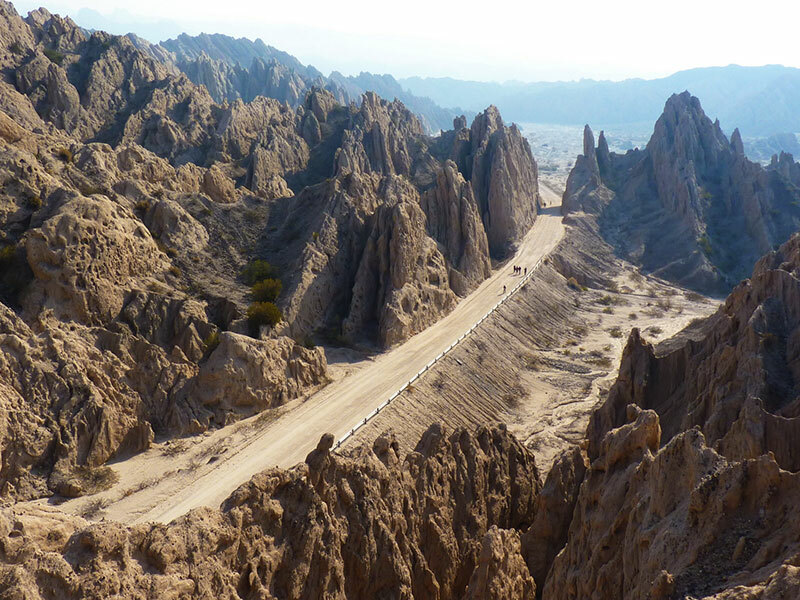 Drive on the Ruta 40 along Calchaquí valley to Molinos, passing through the bizarre landscape of the Quebrada de las Flechas. This valley is best known for its contrast of colors and its unique geography that ranges from the mountain desert to the subtropical forest. 1 overnight stay at the Hacienda de Molinos. Drive distance: 110 km gravel and 20 km paved. 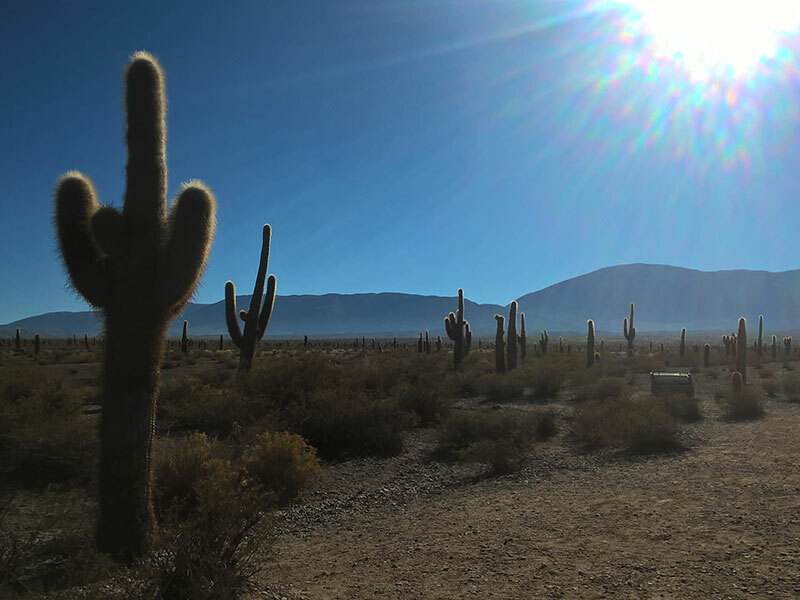 Drive via Cachi to Payogasta, here along the Ruta 33 through the National Park Los Cardones (gigantic candelabra cactus) and down along the impressive Cuesta del Obispo to Salta. 1 overnight stay in the city center. In the afternoon we recommend to visit the Archaeological Museum (Museo de la Historia), which issues the mummies of three children discovered in 1999 on Llullaillaco volcano, at a height of 6739 meters. Distance: 75 km gravel and 135 km paved. 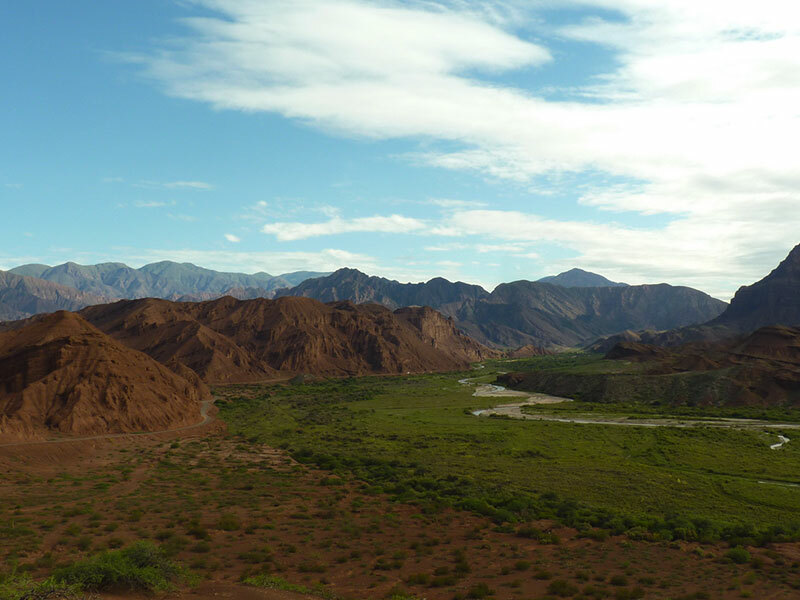 In the morning continue north along Ruta 9 towards Quebrada de Humahuaca. 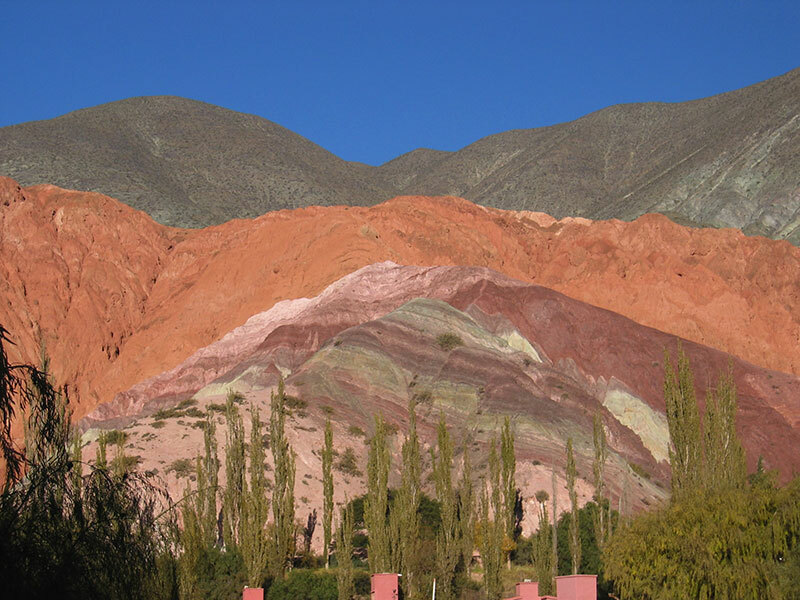 After a 3-hour ride you reach Purmamarca, at the foot of the “hill of seven colours”. 1 overnight stay. 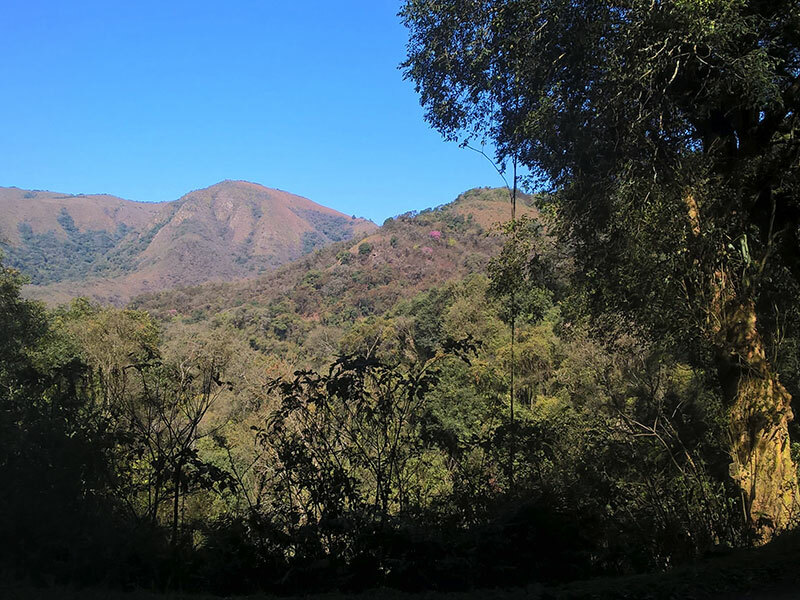 In the afternoon you can visit the local handcraft market in Purmamarca and explore the Quebrada de Humuahuaca with its Indian villages Tilcara, Maimará & Humahuaca. 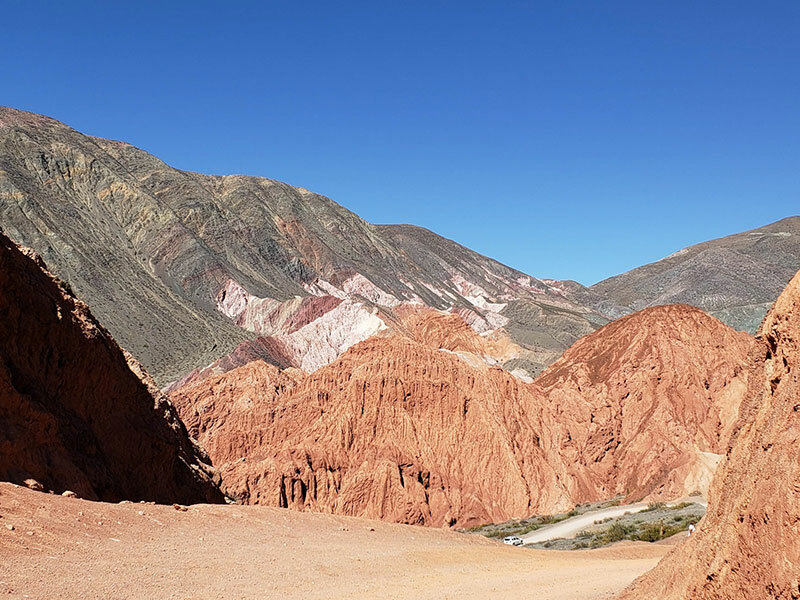 Quebrada de Humahuaca is a narrow and arid mountainous valley, flanked by the high plateau of the Puna and the eastern wooded areas. 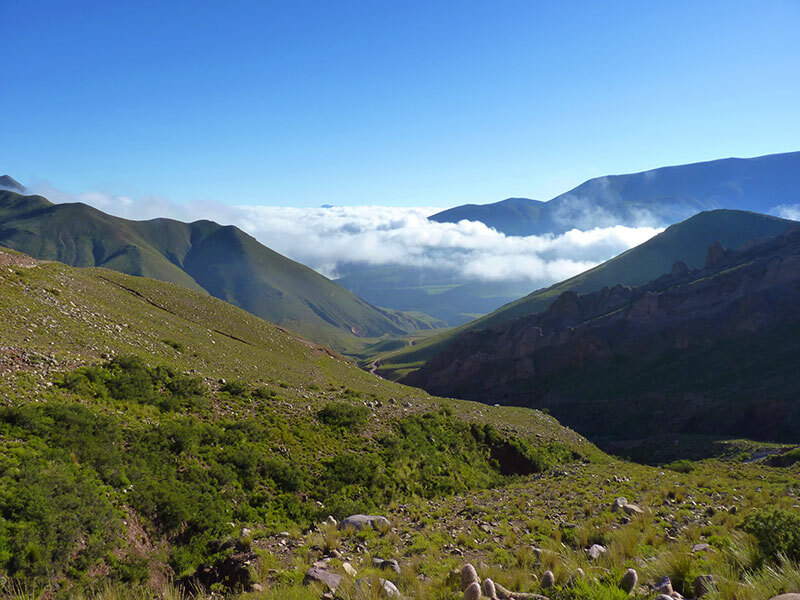 It follows the line of a major cultural route, the Camino del Inca, along the spectacular valley of the Rio Grande. In the afternoon return to Purmamarca. 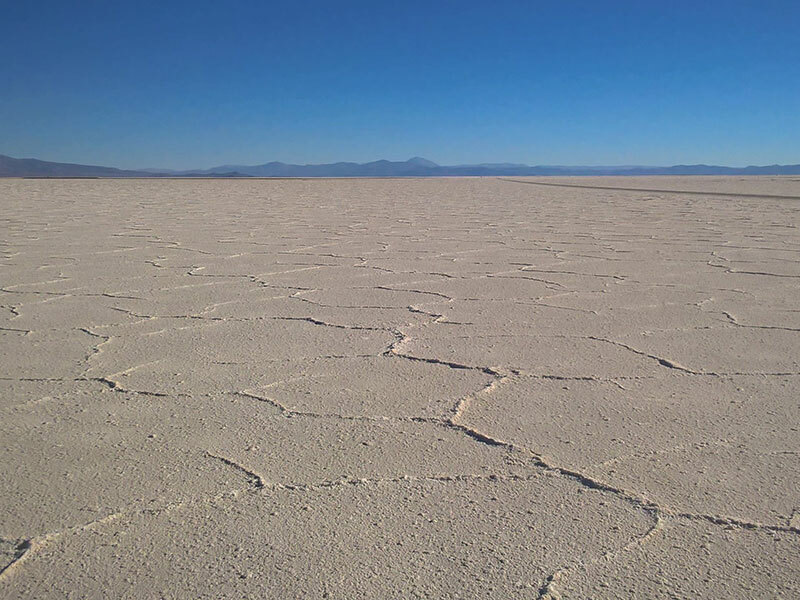 Continue the trip heading up the impressive Cuesta de Lipán to Salinas Grandes (big salt lagoons), an open white space of more than 100km surrounded by volcanoes, where the horizon seems endless. After the visit head on to San Antonio de los Cobres, the old railroad station known as the Train to the Clouds, at the door to the Eastern chain of the Andes & and the “Puna”. 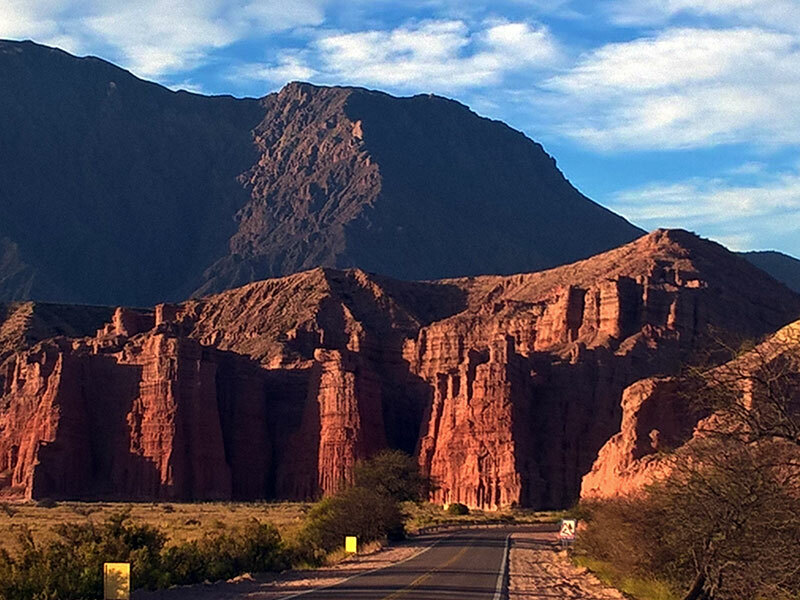 In the afternoon drive to Salta along Quebrada del Toro. 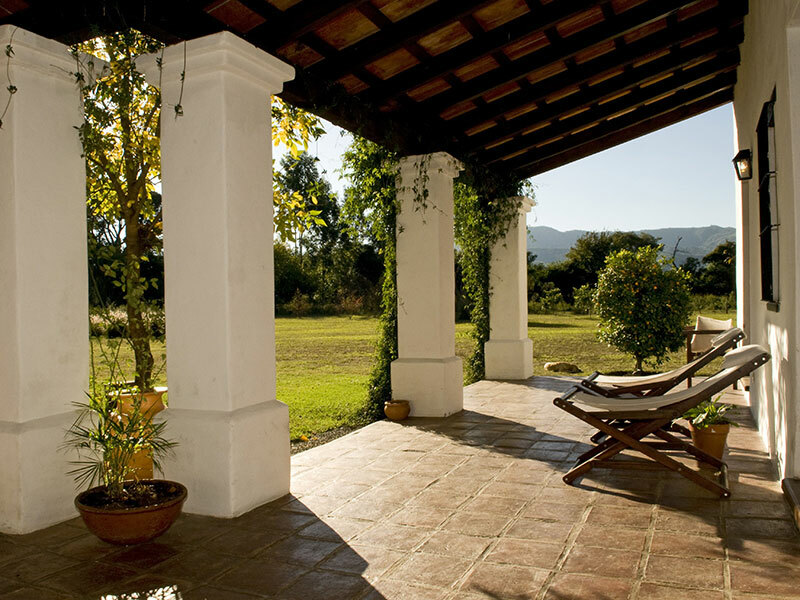 2 overnight stays at beautiful country hotel Finca Valentina. Distance: 215 km paved, 95 km gravel. Day free at leisure. Many hike or horseback ride options in the nice surroundings of the hotel. In the morning car returnee at the airport. Departure flight. Note: this trip can be combined with a direct flight to Iguazú waterfalls and a 3 day stay. All nights in double room with private bathroom incl. Breakfast. Transfer Airport Mendoza – Hotel in Private Service. 12 days rental car Ford Ecosport 4×2 or similar with free mileage, full insurance cover with deductible up to U$D 500 in case of accident &/or minor damages. Second driver GPS incl. Drop off costs of the car Mendoza-Salta. Meals: approx U$D 35 per day / person (lunch picnic, dinner restaurant). Fuel consumption: approx U$D 1.10 / liter.